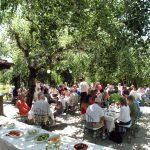 The country restaurant used to be old stables & the owner is proud of keeping the original building unchanged as well as the beautiful gardens with old trees, where our Greek cooking demonstration & lunch will take place. 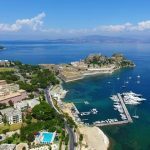 By guided air-conditioned coach we depart from Corfu’s Port and drive inland, through the outskirts of Corfu Town and magnificent countryside of the areas of Tebloni. Near the village of Agios Yannis, approx. 10 km. west from the port, we stop at “Spiros & Vassilis” Country House. This is the most popular country restaurant on the Island of Corfu, situated in the middle of a large farming area. 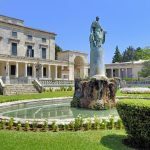 It used to be old stables and the owners are proud of keeping the original building unchanged as well as the beautiful gardens with old trees where a Greek cooking demonstration and lunch will take place. 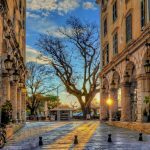 On arrival, participants will be greeted by the chef/owner who will offer them a glass of the traditional aperitif – ouzo accompanied with Corfu olives, Corfu olive oil, feta cheese and villagers’ bread. Tzatziki: A wonderfully garlicky yoghurt dip in which the staple ingredient is cucumber. Taramosalata: A fish roe paste made with onion, breadcrumbs, oil and lemon juice. Moussaka: Layers of aubergine, potatoes and minced meat, topped with béchamel and baked. Later, participants will have lunch, in which the recipes which were demonstrated will be included. The lunch will include the excellent house wine as well as Corfu seasonal fruit and coffee. After lunch participants will be driven to Corfu Town, which is now a member of the World Heritage List (UNESCO), for a brief guided tour. Once the guided tour has ended we will return to back the pier.